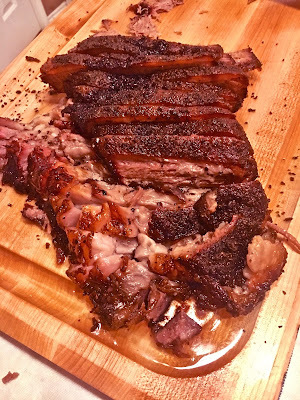 Summer is in full swing and we recently made the most perfect brisket EVER. We splurged on a wagyu Beef brisket from www.farmhousedelivery.com which is a fabulous locally owned company that delivers farm fresh meats and produce to our door. What's even better is it's owned by an Ursuline high school alum! Go Bears! 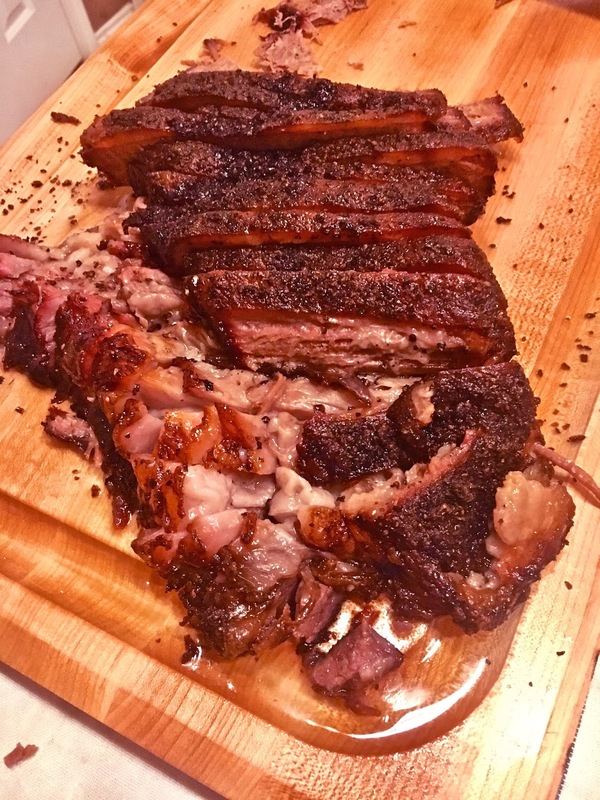 We've made many a brisket on the Big Green Egg and this was hands down the most delicious and successful cook yet. We simply slathered it in Whataburger mustard (our secret weapon- perfectly balanced acidity for grilling), then generously cracked fresh pepper and Himalayan salt all over. Let it come to room temp about an hour. We used B & B hickory and brought the temp to 200 degrees. 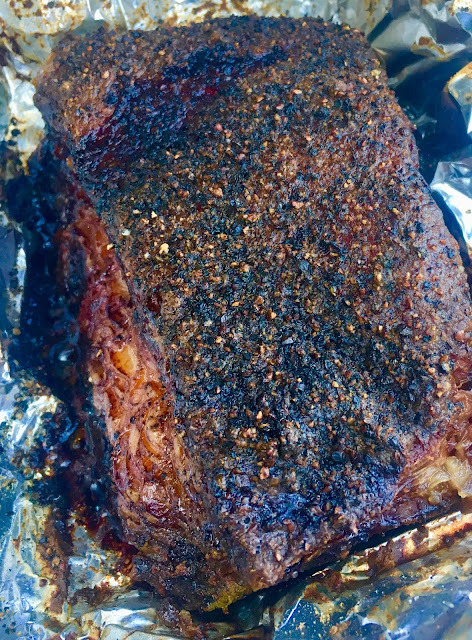 Placed the brisket in foil and indirectly cooked this 5 pounder for 7 hours. We sprayed it with Beef stock every hour. Then we wrapped in heavy duty foil and let it rest an hour before slicing. This truly tasted like MEAT BUTTER. I've never had such a tender and unctuous brisket in my life! Doesn't get much more Texan than that! Fresh corn on the cobb, my Drunken BBQ Baked Beans wrapped up the whole affair with a gluten free local blueberry pie and fresh whipped cream. Lawd have mercy make the tastiness stop!!!!!!!! Asian Pork Belly on the Big Green Egg. This dish is simply unctuous, in a good way! 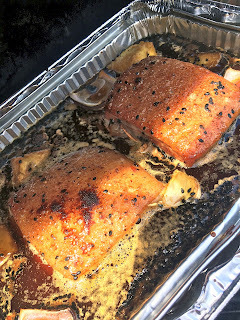 Tender, creamy pork belly braised for over 4 hours on the Big Green Egg was the perfect thing to make on a scorching 106 degree day. The heat of the Texas summers never ceases to amaze me and makes me yearn for the Rockies. I feel very grateful to have a pool to plunge in while dinner cooks on the Green Egg, as it is too hot to cook indoors with this God forsaken heat. 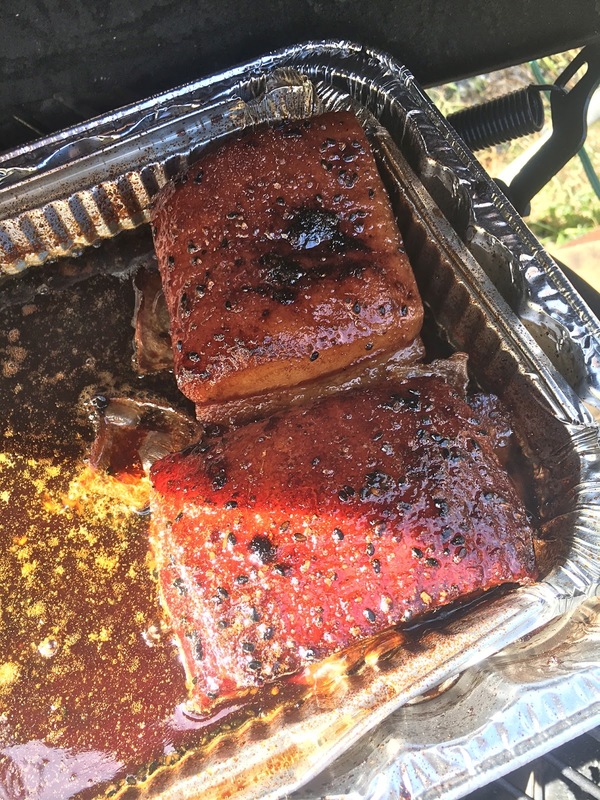 They had some lovely pork belly at our local HEB grocers, so I bought a pound and it turned out even better than I imagined! My favorite rub is Pineapple Dizzy Dust!! Get ya some ASAP!!!!! 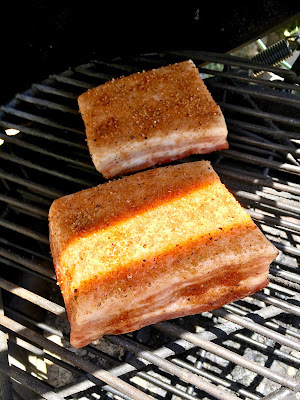 1 pound pork belly- cut into 4 squares (I froze two for later use). 1 small nob of ginger (about a tablespoons)- roughly sliced. 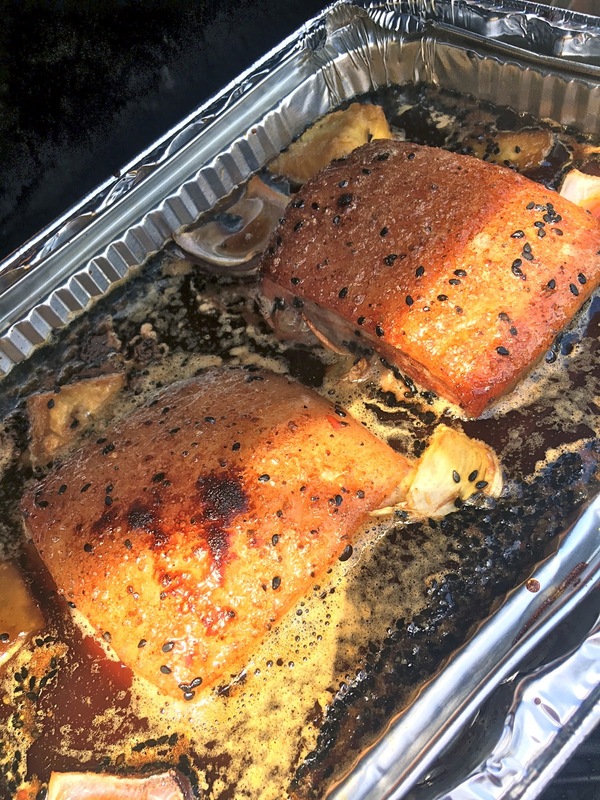 I generously rubbed the pork with Dizzy dust and let it relax in the fridge over night. 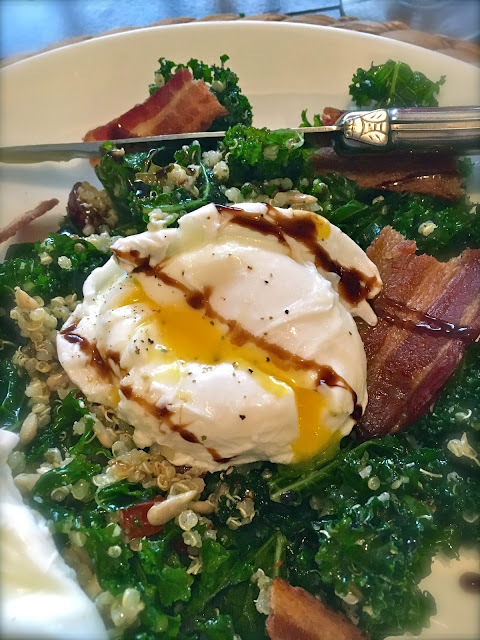 The next day I slathered a half a bottle of SPF on myself, donned a big sun hat, opened up the umbrellas and lit up the Big Green Egg with hickory wood to 225 degrees. We like BG Brand charcoal. With the the plate setter on indirect cook, we gently placed the bellies fat side up on the grate and smoked it for an hour and a half. 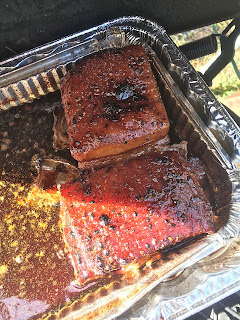 Then in an aluminum pan we added all the remaining ingredients and placed the bellies in the braising liquid, fat side up and raised the temp to 275 degrees and smoked them for 4.5 hours until tender and the fat was rendered on top and crispy. We basted it every 30 minutes with the pan sauce. Once the skin is crisp, remove from pan and let it rest 20 minutes before slicing. Holy Mother this was sinfully delicious and would be great in tacos, with fried rice or on a salad, as I served it. 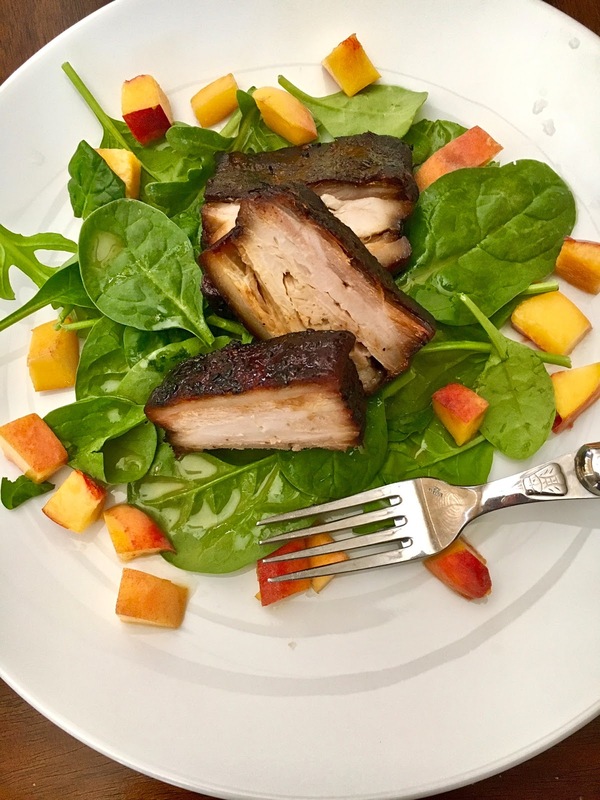 I had some fresh local peaches and spinach and drizzled it with orange vinaigrette for a simple, yet sinfully delicious experience. This freezes well and is easily reheated in a non stick skillet until warm. Wow it's been a while! 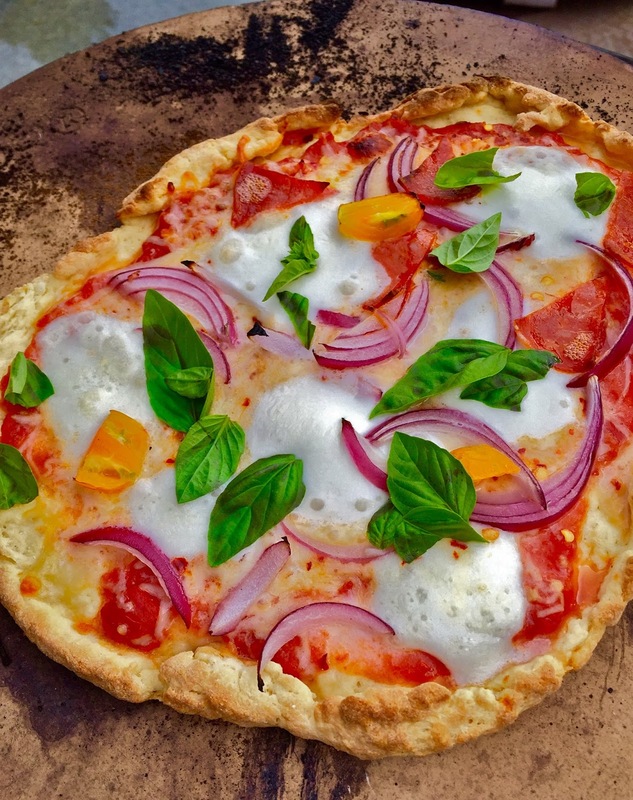 Life has been very busy and I've made a couple of terrific things to nosh on lately with family and friends and this latest was a hit and pretty easy to make as well. 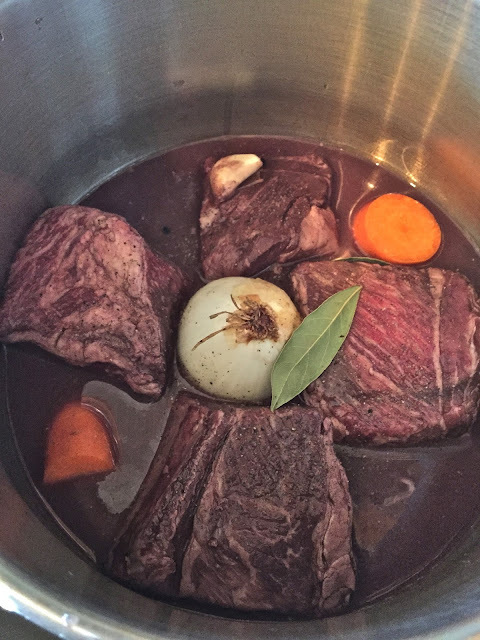 Whole Foods had glorious looking short ribs and while normally I would slowly braise them for about 4 hours in a Dutch oven, I decided to cut the time by cooking them in the pressure cooker for about 75 minutes. They were meltingly tender, rich and satisfying served with ultra creamy risotto or mashed potatoes. 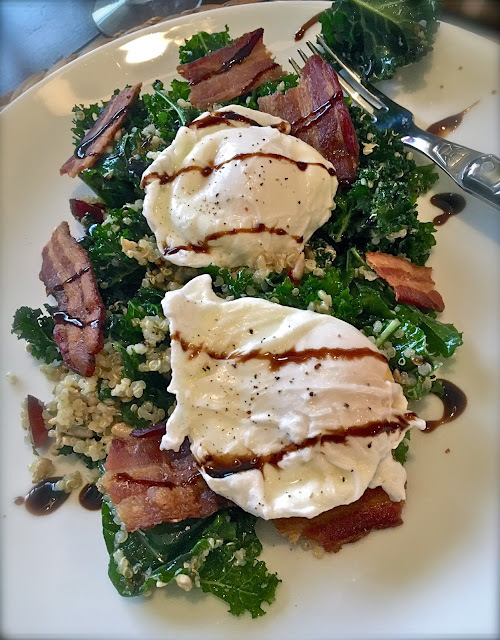 The photo lighting isn't great, but I snapped it with my iphone and I guarantee the photo does not do this dish justice! Marinade the ribs in all the ingredients overnight or for 12 hours. In a pressure cooker add the ribs and other ingredients and cook on high pressure about 75 minutes. 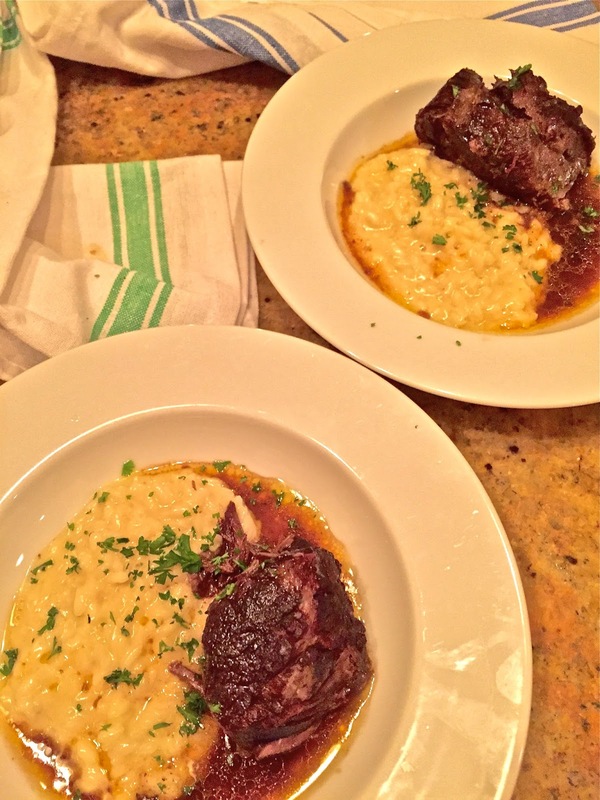 These were really big short ribs, so one hour may suffice for smaller ones. Release pressure, set ribs aside lightly wrapped in foil, strain some as much of the fat from the sauce and bring to a simmer. Reduce about 1o minutes until slightly thickened. 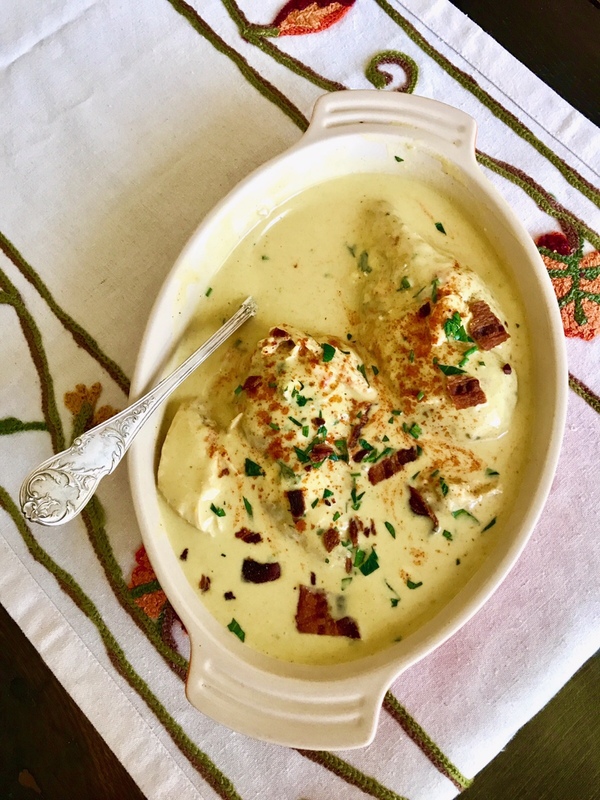 Serve with mashed potatoes or creamy risotto. In a pan over medium heat, melt one tablespoon of butter and coat the rice. Add the wine and cook off alcohol - about 2 minutes. Stir constantly. Then ladle about a 1/4 cup of the warm stock, stir and bring to a simmer. continue ladling 1/4 cups of stock each time it is fully absorbed into the rice, stirring and simmering for about 20 minutes until the risotto is cooked through. Once the rice is cooked , add 2 tablespoons butter and the cheese and stir like crazy. 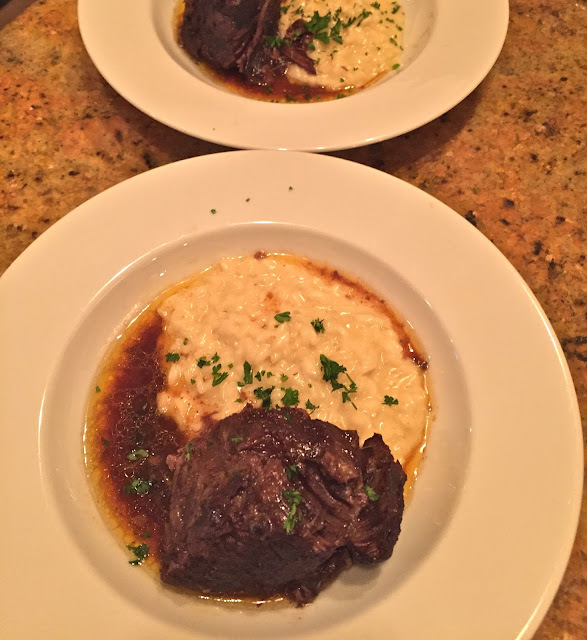 Serve in warmed bowls and top with short ribs and sauce. It's a rainy Memorial Day and while normally we'd be sitting poolside throwing something on the grill, we are forced indoors due to much needed rain and grey skies. It gives one pause to think of those who sacrificed their lives for our freedoms. Granted, everyone likes a day off to sleep in and let loose, but the significance of the day weighs heavy on the mind. I was named after my great uncle who was killed by vicious Germans in the Ardennes Forest during WWI. He was only 27 years old but apparently a brave and kind young man who's life was cut short fighting for what was right and good. I'm proud to carry his name. Since we are indoors and may have a few friends over later, we decided to make some small bites. As a girl I loved Kentucky Fried Chicken like no one's business (except for my grandmother's recipe which was like no other). The original KFC recipe was so tasty and back then they weren't using these freakish lab chickens (so cruel) and harmful GMO stuff. Apparently they did use MSG, and since I'm allergic to it, I'm better off having not enjoyed KFC since the late 80s. 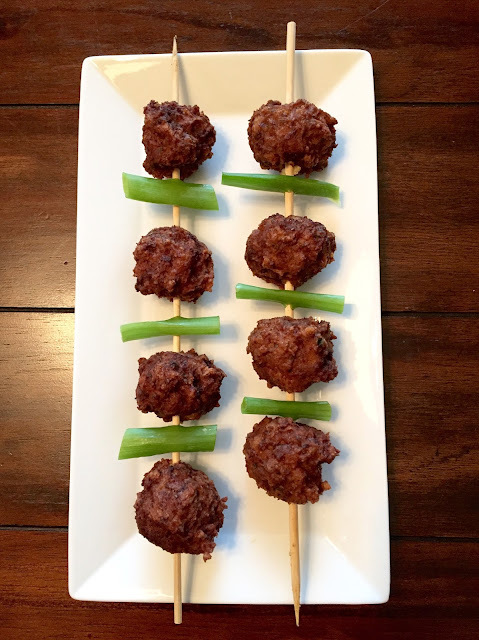 These little meatball poppers have a taste surprisingly similar to the KFC original recipe and are delicious little morsels that also freeze quite well. In a food processor finely chop onions, parsley and eggs. Add mixture to meat with the seasonings and blend well. 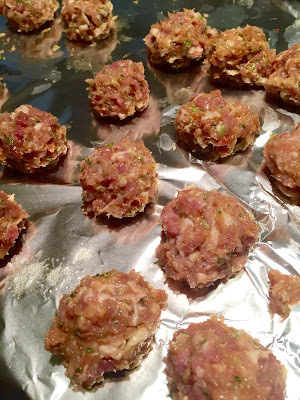 Form into meatballs and deep fry in grapeseed or peanut oil preheated to 350 degrees for about 4 minutes or until golden brown and cooked through. 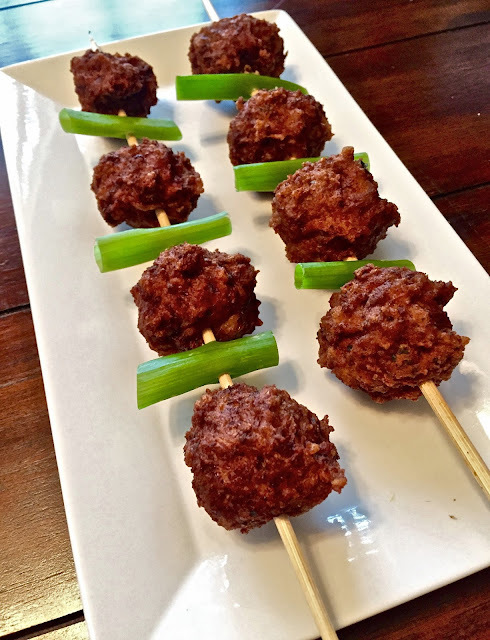 Serve on skewers or toothpicks for easy finer food. 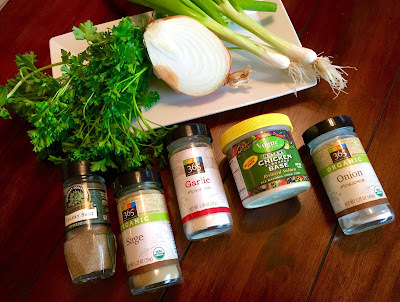 Goes great with Ranch, honey mustard or tzaziki sauce for dipping. A friend from work recently delivered a precious baby boy so we made them dinner and as I stopped by our local French restaurant Artisan to pick up a baguette, Chef had just pulled out a stunning looking clafoutis for that night's dinner service. It smelled heavenly and was dotted with fresh strawberries and I've been thinking of it ever since. 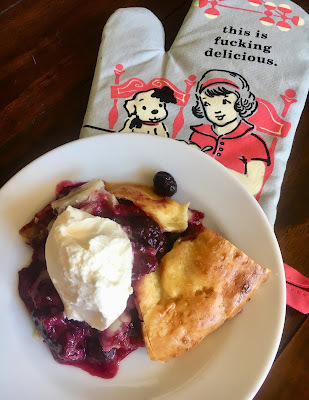 So last night I spotted some frozen wild berries in my freezer and thought how about I try my hand at making a gluten free, low glycemic version of that decadent clafoutis from the bistro? It turned out to be pretty fabulous! So I thought I'd add it to my list of things to cook in the future. 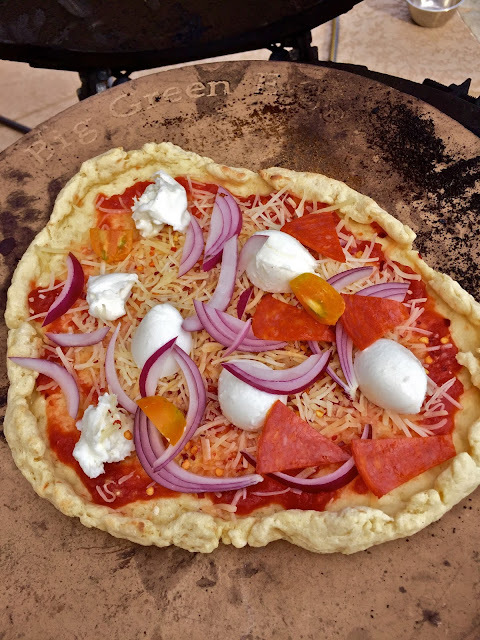 I've added some tweaks to make it paleo or dairy free as well. In a large bowl mix everything but the berries. Pour in a cast iron skillet or baking dish, sprinkle with berries and bake in a preheated 325 degree oven about 40-50 minutes until just set. It resembles a souffle on top and flan in the middle and is comforting, tasty and super easy! This weekend we had our first cold snap and while we were floating in the pool and grilling kabobs on Friday evening, we were snuggled inside while a chilly rain settled on us by Saturday morning. The weather was reminiscent of my childhood days visiting my mother's family in Belgium and it was a perfect day to prepare a slowly braised stew. 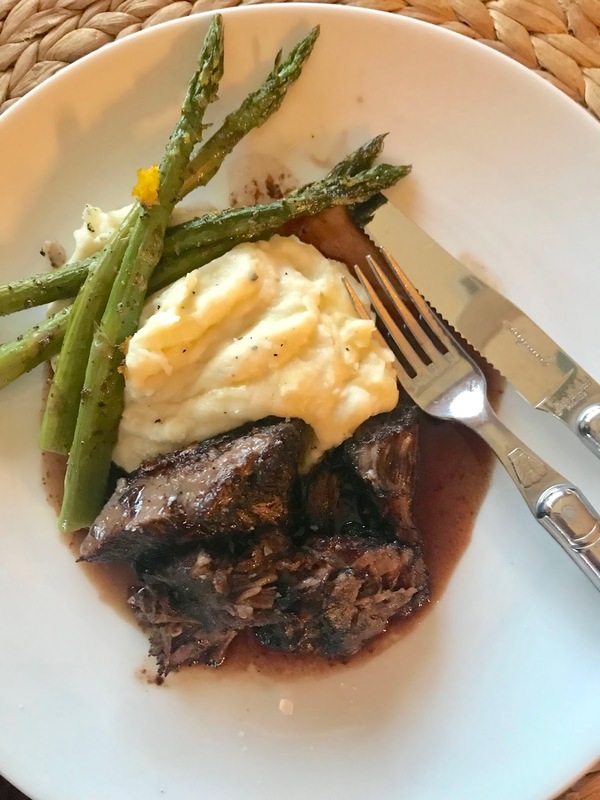 While the French classic beef stew, or beef bourguignon, is made with red wine, the Belgian version known as Carbonnade au Flamandes is made with delicious Belgian beer. The result is a slightly sweet and sour stew that freezes well for quick reheating on a cold evening. Belgium has two distinct cultures- the Flemmish (Dutch relation) and the Waloons. The latter speak french and reside in the southeastern part of the country and this is where my family originated; primarily from the Liege and the Ardennes before settling in Bruxelles. 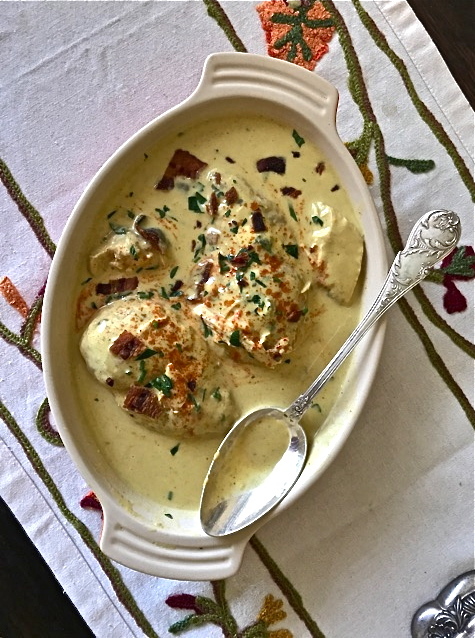 One interesting note I read in a cookbook, The Food and Cooking of Belgium, by Suzanne Vandyck was that since Belgium was at the head of the spice trade in the 16th century, its cooking was far advanced than those found in neighboring France or Germany! Take that snooty Frenchies!! Poor Belgium also does not get credit for inventing the "French Fry". One of my fondest and first culinary memories is of Les Friteries, or french fry carts that dotted the city of Bruxelles. Hot, fresh frites are served with a dollop of mayonnaise and wrapped tightly in a paper cone. Perhaps I should open a few around Austin as I'm certain they would be a huge hit? My husband is an avid beer lover, so naturally he prefers the carbonnade to the French bourguignon version. Served with rustic toast smeared in mustard and dunked in the stew alongside a Belgian ale, it is hearty and satisfying. Since I must strictly avoid gluten and wheat, I have had to adapt the recipe to use gluten free beer such as Bards, but I STRONGLY suggest using a Belgian beer such as Chimay bleu or Trappistes Rocheford. However my gluten free version is still outstanding if not quite as rich as if I'd used a traditional Belgian beer. One final note- this can be made in an hour if cooked in a pressure cooker, but I prefer low and slow for 5-7 hours in the oven at 220. It tastes better reheated the next day. Bouquet Garni- Several sprigs of fresh thyme, 1 sprig fresh rosemary, several sprigs fresh parsley tied with kitchen string. 1.) 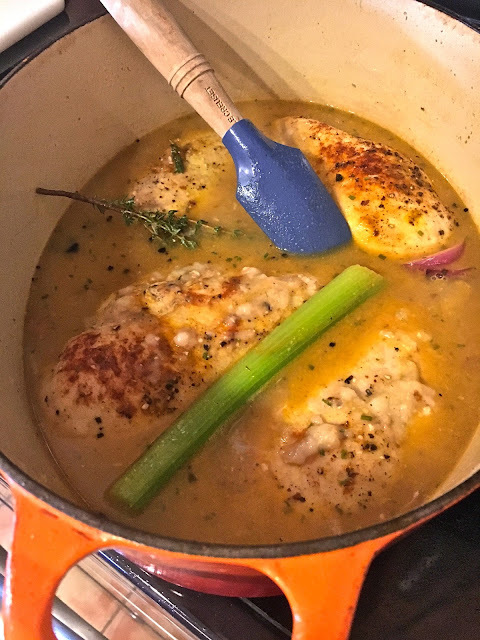 In a large enamel Dutch Oven, melt the butter and add the onions, celery and carrot with the sugar, flour, dash of Worcestershire and a few dashes of beer. Cover and cook onions on medium low for 30 minutes to caramelize. 2.) Meanwhile in a large frying pan, melt bacon until fat renders, add grapeseed oil and when the pan is screaming hot, brown the meat, one pound at a time so as to not crowd the pan which would steam the meat instead of sear it. Sear the cubes about 3 minutes until a brown crust forms on the outside. Reserve the meat on a plate. 3.) You may want to scrape up the brown bits in between browning batches with a little beer and pour that into the onions. Just add more fresh oil to the pan before searing the next batch. This step makes a rich and flavorful base for the stew. 4.) Once meat is browned and onions have softened and started to turn golden, add meat to onions in the large pot, the rest of the beer and herb bundle plus bay leaves and bouillon cube. Cover and let it work its magic in the oven at 220 for 5-7 hours. Serve in warm bowls and sprinkle with fresh parsley and steamed potatoes or Belgian Frites (Fries). Though the dunked mustard smeared bread is a winning combination, a fresh green salad can lighten up the meal but it should definitely be served with a glass of Belgian beer. As my mother would say before tucking into a great feast, "Attaquons!!" ATTACK! !